Please contact Dr. Rozbruch’s office at 212-744-9857 regarding insurance information. His staff will be able to assist you with any questions. The forms required for your initial visit to Jacob D. Rozbruch, MD Orthopaedic Surgery are listed below. Click on each form pertaining to your injury, print it out, and fill in the required information. You may bring them with you to your scheduled appointment. Take I-95S to NYC. Take I-278W / Bruckner Expy Exit (# 6B) on the left towards the Robert F. Kennedy Bridge (Triborough Bridge). Merge onto Bruckner Expy and take the I-278W exit on the left towards the Triborough Bridge / FDR Drive. Merge onto the I-278W and take exit towards Manhattan / Randalls-Ward Is / FDR Drive. Merge onto Triborough Bridge. Take the FDR Ramp and merge onto FDR Drive S. Take Exit #13 towards E 71st Street. Turn right on E 71st Street and then right onto 1st Avenue. Turn left onto 72nd Street. We are located at 420 East 72nd Street. Via George Washington Bridge. Take Exit #2 / Harlem River Drive onto Harlem River Drive toward FDR Drive. Keep left & follow signs for FDR Drive / Harlem River Drive. Merge onto Harlem River Drive. Take Exit #20 to merge onto Park Avenue toward E 132 Street. Turn left onto E 106th Street. Turn right at the 1st cross street onto Lexington Avenue. Turn left onto E 72nd Street. We are located at 420 East 72nd Street. Via Lincoln Tunnel. Take the left Exit toward I-495 E / 42nd Street / RT-9A / All Points. Turn right onto W 40th Street. Turn left onto 8th Avenue. Turn right onto W 58th Street. Turn left at the 3rd cross street onto 6th Avenue. Continue on Center Drive to E 72nd Street. Continue onto E 72nd Street. We are located at 420 East 72nd Street. Via Long Island Expressway toward NYC. LIE becomes I-495W. Take Exit #15 onto the Queens Midtown Expy toward Van Dam Street. Turn right on Van Dam Street. Turn left on Tomson Avenue. Turn right onto Queensboro Bridge-Upper Level toward Queensboro Bridge Upper Roadway. Go 1.6 miles. Take ramp toward 60th Street W. Turn right on E 62nd Street. Turn left onto 1st Avenue. Turn left onto 72nd Street. We are located at 420 East 72nd Street. Take I-278W towards the Triborough Bridge. Take the exit towards Randalls-Ward Is / Manhattan / FDR Drive. Merge onto Triborough Bridge. Take the FDR Ramp and merge onto FDR Drive S. Take Exit #13 towards E 71st Street. Turn right on E 71st Street and then right onto 1st Avenue. Turn left onto 72nd Street. 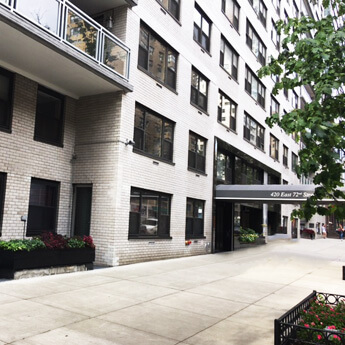 We are located at 420 East 72nd Street.